and font sizes and activate them with a single mouse click. build-in messages like "ADDS INCOMING!" or "PURGE!". channels than /group, check the readme. To install extract "scripts" folder into your Secret World directory. Click Yes if asked to merge. click on a link that will show up. bottom of interface to recommend it to your group and cabal! me either here or send me a PM on official forums (same nick). - Script was renamed to Macro Unleashed. - Script was completely rewritten to use new modular structure, allowing easier creation of custom messages and some extra functionaliy. - Custom message colors are now supported. - Custom font faces for messages are now supported. - Longer chat messages are now supported. - Targeted messages were removed, as they don't seem to work with new script structure. dont know if this is a bug or just an oversight. but when i recommend the script to the Cabal channel it shows up in the Officer channl. Argh, totally forgot about it. Thanks for reminding! It seems that when you're officer, the /cabal command sends messages to Officer channel instead of Cabal one. Many officers in my last Cabal had this problem, and didn't even notice they're using wrong channel ^^. 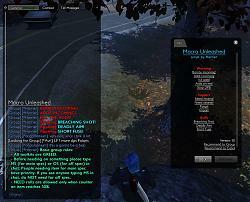 I'll probably contact Funcom support soon to report this and couple other matters I discovered witch chat commands. At the very least they might be able to give me some workarounds. Last edited by Pandamonium : 07-18-2012 at 01:40 PM.